Alexandria Prenatal Yoga: Prenatal Yoga Classes Three Times a Week! Have you ever searched for “pregnancy yoga classes near me”, “prenatal yoga classes near me” or even, “prenatal yoga center?” in your search engine? Well, look no further than Refresh Yoga Center. There is no better place for prenatal yoga in Alexandria, Virginia. When can I do Prenatal Yoga in Alexandria, Virginia? We offer yoga for pregnant women three times a week. On Tuesday evenings, you can join us after work and after rush hour at 6:45 PM for our semi-private pregnancy yoga classes. If you are more of a weekend warrior, join us either at 10:00 AM Saturday or 9:00 AM Sundays. Our wonderful teachers will offer you a way to not only get some safe exercise but to also learn relaxation and stretch techniques to help you throughout the pregnancy. Most of our mothers-to-be come to us with no yoga experience. They are told by their doctors to search for “pregnancy yoga near me” and hope for the best! We understand this, and our qualified pregnancy yoga teachers can guide you through the prenatal yoga class so not only will you acquire some safe prenatal exercises for you and baby, you’ll be setting yourself up to continue a yoga practice after childbirth. It’s a perfect way to help your body heal and find some time for self-care after baby’s arrival. Will pregnancy yoga be too hard? Too easy? In our semi-private pregnancy yoga classes, you are able to bond with the other women in the group. Everyone might be in a different stage of pregnancy, so you can ask questions and compare experiences. Often mothers worry about staying fit during pregnancy. Others worry that the class might be too strenuous. Because of our small class sizes, our teachers are able to tailor the practice to each mother’s needs. We also recommend you try all of our teachers to find the one whose style you like best. Some days you will be tired and crave a more restorative practice. (Those are also days when it is tempting to skip class. Don’t do that!) On others days you will have so much energy you will ask your teacher to ramp it up! These prenatal yoga classes will give you opportunities to stretch, relax, breathe, share, strengthen, and learn. What about your partner, you ask? Our qualified teachers offer private and group prenatal workshops to teach techniques to you and your partner in preparation for childbirth. While many people are skeptical at first, these lessons come in handy down the road! It’s important to discuss and prepare for these sometimes uncomfortable topics in advance. Our prenatal instructors create a playful and fun environment for these workshops. 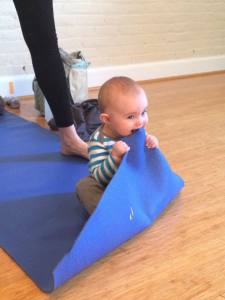 What about Post Natal Yoga in Alexandria, Virginia? Yoga is just as important post-pregnancy. The benefits are two-fold. You can either use our restorative and slow flow yoga classes as a time for self-care, to meditate, and start to heal your body. You can also sign up for our baby and me classes offered several times a month using the same prenatal class package. Baby & Me classes offer a chance to bond with your baby and learn useful tips from other parents. There is also research to support that when children see you exercising they start to mimic those healthy habits. One can never start too young! We know you have many choices for yoga studios in Alexandria, Virginia, so we are honored that you choose us. Sign up for one of our pregnancy yoga classes today.